Indian urban population is about 28% and slated to reach 40% by 2030. But cities take up only 3% of the country's total area. Any approach to sustainability will need to create more urban space. "India needs to double the area of urban space from 3% to 6%," says V Suresh, former chairman of HUDCO and principal executive officer of construction company Hirco. India could be on target here with a large number of new - and relatively more sustainable - developments planned. Acting on customer complaints of manipulation by meter readers, the Delhi Jal Board has hired about 300 ex-servicemen on contract basis to facilitate the job. “We have a lot of vacancies. The decision to hire ex-servicemen on a contract basis would help us in filling those vacancies on a contract basis,” said Prashant Goyal, Member (Finance), DJB. According to sources, the Delhi Subordinate Service Selection Board has not carried out any new recruitment in the past few years, something that has left the Delhi Jal Board incapable of filling its vacant positions. Goyal said the water utility has already issued letters of appointment to at least 300 candidates, of which at least 50 have already reported for work. New Delhi, Jan 31 (PTI) Reliance Infrastructure-backed discom BYPL and BRPL have contested findings of Delhi's power regulator DERC which had detected certain "discrepancies" in their audit and observed that the financial position of the companies was not as bad as has been made out to be. In an affidavit filed before the Delhi Electricity Regulatory Commission (DERC), the discoms questioning the findings of the regulator, termed them as "baseless, frivolous and surprising", sources said. The discoms -- BSES Rajdhani Power Ltd and BSES Yamuna Power Ltd -- said they followed the methodology suggested by DERC in an order in 2003 to analyse their financial status. The discoms in the affidavit said a clarification to the January 25 order of the regulator indicating that the companies may have exaggerated their fund crisis had already been filed with the regulator. The DERC last month had asked the discoms to submit a detailed account of their monthly revenue generation and expenditure since April 2011 so as to keep a tab on their accounts. After scrutiny of the audit reports, DERC last week had found "prima-facie unexplained discrepancies" in the power purchase cost by both BSES Rajdhani Power Ltd and BSES Yamuna Power Ltd.
NEW DELHI: Reliance-backed discoms BSES Rajdhani and BSES Yamuna have stuck to their stand that their liquidity crisis was not exaggerated. They have submitted a clarification to Delhi Electricity Regulatory Commission(DERC) on their accounts. "We have already made detailed submission to DERC regarding the financial package being worked out by the IDBI led consortium of banks. Both the promoters have already pledged fresh equity infusion in BSES discoms of which Reliance Infrastructure has already invested Rs 520 crore (51% share). Delhi government is expected to infuse its share of equity soon. This is to ensure that consumers continue to get regular power supply," said a spokesperson. In laxmi nagar district centre, HT CONNECTION was provided to laxmi deep, vikasdeep and other buildings . After completion of these buildings in all respect, buyers were handed over the possession of individual flats. Moon light company was created by ANSALS to render services to flat owners and moonlight started acting as distribution company and started collecting electricity charges. MOONLIGHT IS NOT A LICENCEE AND HENCE CANNOT PROVIDE PERMANENT electricity connections. We are being denied permanent connections by BSES YAMUNA POWER LTD.
KINDLY HELP ABOUT 100 flat owners in this vikas deep building. Do you think BSES has any right to add Fuel surcharge in the next bills ? DERC has raised the objections on the Audited statements of BSES. Earlier Mr Vijay Goel lodged the strongest protest from Talkatora stadium in the presence of over 2000 RWAs. Various opposition party's too have raised doubts over it. Hundreds of RWAs including our "EAST DELHI RWAs JOINT FRONT", raised doubts on the working of BSES in various Public hearings with DERC. Once again, we have mailed our objections on the Audited statement of BSES to DERC with a copy to CM on 27th January with a request to opt the CAG Audit and to Roll Back the prices. Inspite of all this, there is again a news in the media, that, in the next Bills, BSES will add the Fuel Surcharge and the consumers will have to pay more. withthanks : Nav Bharat Times : LINK for detailed news. Our Republic Day Celebration , Flag Hoisting by MLA Mr. Sunil Vaid, Councilor Dr. H.S.Kashyap, President of RWA Pocket-3, Mayur Vihar-1 Delhi, Jeet Kumar. Honoring Our Sr. Citizens with Shawals, Prize Distribution to app. 40 Participants in various Sports Competitions held on 2nd Oct 2011 Gandhi Jayenti; by our Councilor Dr. H.S Kashyap. Delhi BJP president Vijender Gupta has demanded that Delhi Electricity Regulatory Commission and the state government file a case of fraud against power companies that submitted forged accounts to DERC. A recent DERC report had indicated that despite getting a profit, two Reliance companies had shown a loss to get a bailout package. Gupta said the bailout package given to the power distribution companies should be taken back with interest. “DERC in its preliminary examination of the accounts of BSES Rajdhani and BSES Yamuna, both Reliance Infrastructure firms, found that the information given by them about purchase of electricity is full of discrepancies. Instead of submitting clear data, they have made the process more complicated. A criminal case should be registered against these companies,” said Gupta. 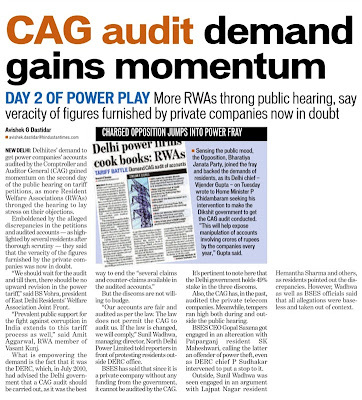 Leader of opposition in Delhi Assembly Vijay Kumar Malhotra said the CAG should check the accounts. Water meter reading problem ? Proud to be a voter & Ready to vote ! Traffic problem in East Delhi areas ! Happy Lohri to all of you ! PERFORMANCE STANDARDS OF DISCOM'S ? मुनाफे में हैं डिस्कॉम, तो क्यों है घाटे का रोना! This is the Capital of India ! Will it make Indian Rupee Stronger ?